No matter how much laundry you do, there always seems to be more dirty clothes waiting to be loaded into the washer. While it’s not going to sort the colors from the whites or iron and fold for you, a quality laundry basket can make the task that little bit easier. But, with so many laundry basket options available to you, how do you pick the best one? We reviewed dozens of laundry baskets to identify the best of the best. To help sort the stars from the duds, we considered a range of features, including construction material, durability, capacity, appearance, ease of carrying, and opinions from existing users. A beautiful laundry basket hand woven out of water hyacinth. After careful consideration, the BirdRock Home Water Hyacinth Laundry Baskets stood out to us as our top pick. Not only do they look great, but they’re sturdy and lightweight. Plus, with two in a pack, you can use one for dirty and one for clean washing, have one for you and one for a partner or child, or keep the second as a backup. Want a laundry basket that has style as well as substance? Look no further than these Water Hyacinth Laundry Baskets from BirdRock Home. 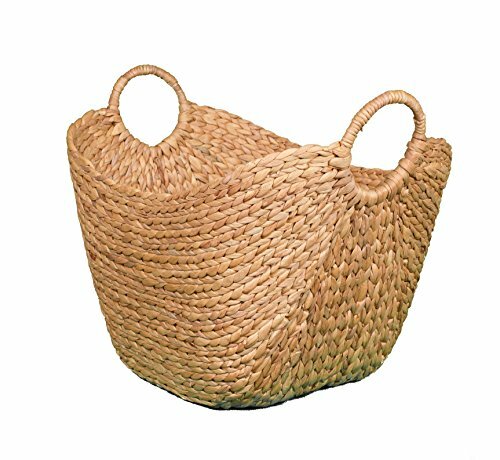 Woven out of water hyacinth with an attractive espresso color finish, there’s no denying these baskets look much better than a standard plastic model. What’s more, water hyacinth is renewable and abundant, making it a much more eco-friendly choice than plastic or other synthetic materials. Weighing around a pound a piece, these baskets aren’t heavy to lug around your house, even when full with wet laundry. Measuring approximately 18 inches by 19 inches by 14 inches, there’s plenty of room for a full load. The handles are strong and reinforced, so you don’t have to worry about them letting you down. Retailing at around $90 for a pack of two, these laundry baskets aren’t cheap, but they are rugged and high-quality, and it’s nice to have a spare. The thoughtful curved design makes this laundry basket easier to carry. If you’ve ever tried to carry your laundry basket one-handed, while you use the other to pick up the socks your kids have strewn all over the floor, you’ll know it can be an awkward balancing act. With one edge curved gently inwards, the Rubbermaid Hip Hugger Laundry Basket is the perfect shape to rest on your hip for one-handed carrying. In all other respects, this is just a standard plastic laundry basket, albeit a sturdy, well-made one. The grab through handles make it easy to get a grip on and the smooth finish stops your laundry from snagging on the basket. It measures approximately 9.5 inches by 25 inches by 18 inches, which is ample for most. At just under $20, it does cost more than some plastic laundry baskets, but the quality of construction and the hip-hugging design make it well worth splashing out. This affordable option can be used as both a laundry hamper and a laundry basket. While the fabric construction might make the Lifewit Medium Laundry Basket look more like a simple laundry hamper, it’s actually the perfect hamper/basket combo. Place it in your room to fill up with dirty washing, then use the handles to haul the whole lot down to the washer. Thanks to the PEVA waterproof coating, you can put your wet washing in the basket to take to the dryer or to hang out without soaking it through. While there is a larger option available, we’re focusing on the medium basket, which measures 16 inches by 13 inches by 13 inches and comes in a pink and white striped pattern. With a retail price of just $12, this laundry basket offers exceptional value for money. It might not be quite as durable as our top choices, but it’s reasonably durable and features reinforced handles. A traditional wicker laundry basket with a range of great features. More and more people are moving away from using plastics in favor of more eco-friendly materials. If this is something you’re interesting in doing, consider the Household Essentials Willow Wicker Laundry Basket. Sure, at $25 it costs a little more than a basic plastic laundry basket, but it looks great and will stand the test of time. Plus, it’s fully biodegradable when you’re done with it. This wicker model can be used as a laundry basket and a laundry hamper. It features a cotton liner, which you can easily remove when it’s time to put wet laundry into the basket. In fact, the liner itself is machine washable and can be used to wash delicate items inside to prevent them from snagging in the machine. Excluding the handles, it measures 11 inches by 14.5 inches by 19.5 inches. The hand-woven wicker construction is highly durable and the slightly curved edges make it easy to carry. Easily folds away when you don’t need it. Unless you have ample storage space at home, you might struggle to find space to store your laundry basket when it’s not in use. You won’t, however, have that issue with the SAMMART Collapsible Rectangular Laundry Basket. It collapses to less than four inches tall, so it’s easy to stash in a closet, under the bed, or in a gap between your washer and the wall. Despite being collapsible, this laundry basket is still exceptionally sturdy. It’s made from a combination of hard and soft plastics, all of which are completely BPA-free. When expanded, it measures approximately 25 inches by 19 inches by 10 inches; plenty big enough to carry a full load of laundry. This basket comes in three colors, all of which cost around $25. While that isn’t cheap for a laundry basket, it’s worth spending that little extra for the convenience of it’s collapsible nature. In our opinion, laundry baskets are household essentials that we all need, so everyone should buy a laundry basket! Even if you already have a perfectly good laundry hamper, a laundry basket is useful for transporting a single load of laundry to the washer and then transport the wet clothes to the dryer (if it’s located elsewhere) or to hang outside. Using a laundry basket if so much easier than just carrying an armful of clothes. Laundry baskets are designed for this purpose so have a range of features that make them perfect for the task at hand. You’ll also want a good ironing board to keep your clothes wrinkle-free. Material. Most laundry baskets are either made from plastic, or from wicker or other woven natural materials. However, you can find some options made from fabric. Plastic models are inexpensive and won’t get wet or waterlogged, but they look cheap and plastic isn’t good for the environment. Wicker and woven baskets look great and are sturdily made, but they can be expensive. Fabric laundry baskets aren’t usually the best option if you want to put wet clothes in them, as they get waterlogged. Size or capacity. An average laundry basket is designed to fit a single load of laundry. If you have an extra larger washer or dryer, you might choose to look for a bigger option. Durability. Your laundry basket should be strong enough to carry wet washing over some distance, especially if your dryer is in your building’s basement or you use a dryer in a laundromat. While plastic laundry baskets are strong, the plastic can break if treated roughly. Quality woven baskets are extremely durable, but cheap models can be lacking in that department. Ease of carrying. Make sure your chosen laundry basket is comfortable to carry. The handles should be well-placed so you don’t have to hold it awkwardly. Some models are curved to easily rest on the hip. Overall appearance. Plastic laundry baskets might be cheap and practical, but you can’t deny that they’re ugly. Wicker and woven baskets have a classic look, so you wouldn’t be embarrassed to leave them lying around the house with guests over. 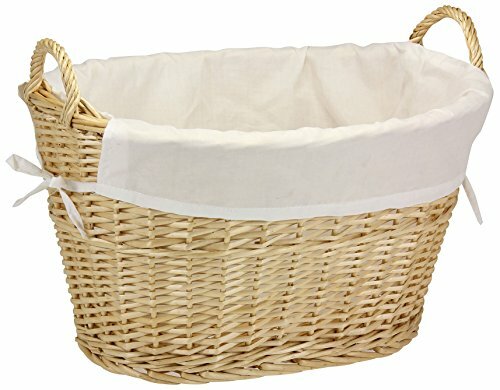 Is wicker or plastic better for a laundry basket? There’s no simple answer as each type has its pros and cons. We love the look of wicker laundry baskets, but we love the price of plastic models! Will wicker laundry baskets mold if they get wet? Mold and mildew can grow on wicker laundry baskets, but it shouldn’t do so if you only put wet clothes in there for a short amount of time. If you regularly unload your washer into a wicker laundry basket and leave it there for several hours before putting it in the dryer or hanging it out, the basket is likely to get moldy. If you get straight on with the drying, your wicker laundry basket should remain mold-free. How much ventilation should a laundry basket have? You may have noticed that many laundry baskets feature ventilation holes. Wicker baskets are often woven with gaps for ventilation. These ventilation holes stop wet clean clothes from starting to develop mildew and turning musty if you leave them in the basket for a little while before drying. They also stop dirty clothes from becoming too ripe while waiting to be washed. There’s no perfect amount of ventilation for a laundry basket, but it should ideally have some. 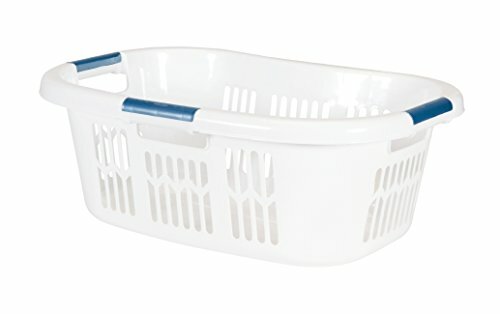 What’s the best shape for a laundry basket? Everyone has their own preference for laundry basket shape. While we don’t think there’s a single best shape, we generally find square or rectangular laundry baskets easier to carry than round or oval ones. We looked at 20 other laundry baskets. 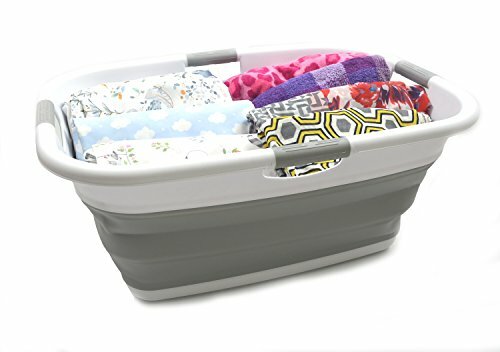 Even though they didn’t make our 5 best laundry baskets list, they’re the best of the rest and each is still a great option. The information you’ll need to compare each one is included with the listing. This sturdy pair of nesting laundry baskets neatly stack one inside the other when you don’t need them, saving on space. This stunning wicker laundry basket features plenty of ventilation and a removable washable liner for collecting dirty clothes in. Carefully woven from seagrass, this attractive laundry basket is both durable and flexible. With a small load of washing inside, you can easily carry it one-handed. This large 25-inch by 19-inch laundry basket has a classic appearance and it practical to boot. The loose weave allows for ample ventilation. Available in a range of colors, this plastic laundry basket is large and versatile but might not be the sturdiest option out there. This strong, flexible laundry basket makes toting your laundry easier, as you can hold both handles in just one hand. The comfortable, reinforced through-handles make this laundry basket stand out from the crowd and mean it should stand the test of time. Due to its flexibility, this laundry basket can squeeze to small spaces and is easier to carry one-handed. However, its height can make it unwieldy. In need of laundry baskets for the whole family? This pack of six basic square baskets offers excellent value for money. The pleasant appearance of wicker meets the ease and practicality of plastic. An excellent choice if you want a wicker basket with no chance of mold forming. With the simple lock-and-go strap, you can easily carry a whole load of laundry completely hands-free. You’ll never lose this vibrant red laundry basket, even when it’s folded flat to save space. Large enough for big loads. Despite its collapsible middle, this is a heavy duty laundry basket that can stand up to some heavy handling. The extra ventilation in the base and the rim helps keep mold and mustiness at bay, even when you can’t dry your laundry right away. Stands out thanks to its striking blue and gray stripes, but the lack of ventilation may be an issue for some. With three colors available, this sleek collapsible laundry basket has a modern appearance and is an excellent space-saver. Not only does this laundry bag fold down completely flat when not in use, it’s made from waterproof material, so it can take wet laundry, as well as dry. They might not be suitable for wet washing, but this pair of canvas laundry baskets look good and are well-made. 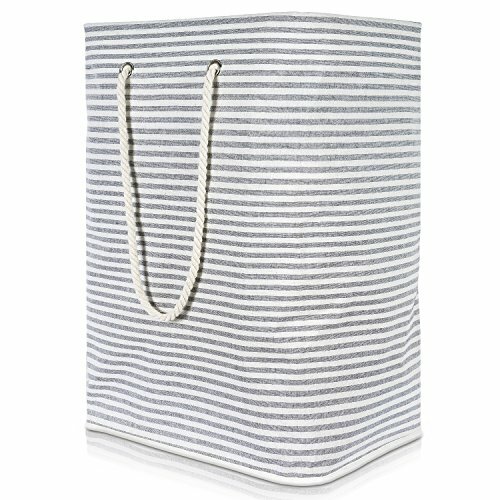 If you want a fun, stylish, and inexpensive laundry basket, this is a great option. Comes in six cool patterns. Again, this isn’t suitable for taking wet clothes straight from the washer, as it isn’t waterproof, but it works for collecting dirty clothes or taking clean, dry laundry to be sorted and put away.